Dash Cams are becoming more and more popular these days because they are now deemed important to have in any vehicle no matter how short the journey. They almost act as a witness should there be an accident where you may or may not be involved in. Dash cams can now come in the form of rear view mirrors that sit comfortable on your existing windscreen mirror. They provide a variety of features such as a reverse parking assister – making reversing a lot easier and comfortable for people who aren’t that confident when reversing. 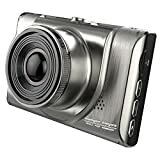 LCD Screen – This dash cam comes with a handy 3.5” LCD Screen that lets you view what is being recorded, so you can adjust the camera to suit your needs. 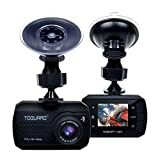 Loop recording – If you get a lot of use out of your dash cam it can fill up the storage with old recordings you no longer need, this dash cam uses a loop recording technique so it will delete the oldest recordings to fit new ones on. 1 year warranty – This dash cam comes with a good 1 year warranty so should you run into any problems you will be well looked after. 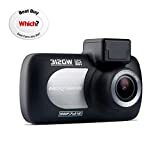 Free SD card – With the purchase of this dash cam you will also be given a High Speed Class 10 32GB SD card – which is ample room for plenty of recordings. 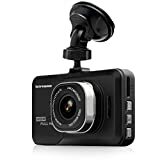 This rear view dash cam has everything you need to record all the important moments whilst driving – this dash cam is perfect for first time users and is very competitive in terms of price which is why it’s in top spot. LCD Touchcreen – A spacious 7” LCD touchscreen is perfect for you to adjust settings this dash cam provides. It also provides a split screen display. Integrated Sat Nav – This dash cam has a sat nav integrated so you can follow important directions and it will continue to record what’s happening on the road as normal. Android system – If you are no longer driving you can use one of the many apps included on its android system. You can play games, watch videos and listen to music all on one device. Wi-Fi – This dash cam also has Wi-Fi so you will easily be able to download new apps and upload your recorded videos online with ease. This rear view dash cam is a great all-in-one alternative to other basic dash cams as it provides everything you need and more. This is a higher end device so it does come with a bigger price tag than other dash cams but with everything it provides this cam should definitely be considered. 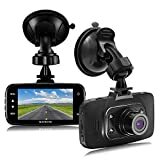 Android operating system – This rear view dash cam is based on an android operating system that provides many features for its users. It has a lot of games and apps that can be used when parked up and has the ability to play music and full length movies. Built in navigation system – During recording this dash cam will let its users take directions from the integrated navigation system. Ultra-thin design – A great compact design that is lightweight, thin, modern, and won’t fall from the windscreen mirror even when driving on rough terrain. 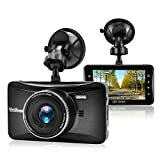 5” Touchscreen – This dash cam provides a big 5” touchscreen that can be used to select apps and provide an instant playback of any previous recordings. For the price this, KKmoon product should not be looked past in terms of quality and the features it provides. If you don’t have an awful lot of money to spend on a dash cam you should definitely consider looking at this KKmoon product as it provides all the basic features and it’s very affordable. GPS navigation system – A simple GPS navigation system that can be used whilst recording the road. Loop recording – The loop recording feature will save you from deleted old unwanted videos, when the storage is full it will automatically overwrite old videos with new ones, so you don’t have to spend hours deleting. G-Sensor protection – G-Sensor protection will automatically detect a collision and will save the recording for use at a later time. It will also protect other videos and files from becoming corrupt. Wide dynamic range – This dash cam lens has a 140 degree angle view which gives the camera more to see during recording. In conclusion, this Toguard Dash Cam has all the basic features you need to protect yourself when going on any journey and for the price and extra features it provides makes this a big contender in the rear view dash cam market. Motion detection – When you leave your vehicle alone the dash cam will automatically start recording if it senses anyone in front of the car. Auto loop recording – This dash cam will overwrite old camera footage with new footage if the storage is getting full. Wide camera angle view – This read view dash cam has a 140 degree wide angle view so it will see a lot of things most other dash cams do not. G-Sensor support – As with most dash cams, this one provides g-sense support so it will protect all previous recordings upon detecting a collision. This rear view dash cam has everything and should definitely be considered as one of the top rear view dash cams available. Not only is this product very affordable but it also comes with 3 years warranty which is a lot more than other manufacturers provide – the warranty alone is worth the price of this dash cam. The Falcon Zero F-360 HD Rear View Mirror Car Dash Cam was always going to be in top spot thanks to its unique design and that fact it provides a lot more than its competitors. It’s a high quality product that should be more expensive but the price tag is still a lot lower than many of its competitors, which is just another reason to snap this dash cam up.